Imagine you are cruising down a river on a one-ton vessel, breathing in the cleanest air your lungs have ever tasted. To your left and right are vibrant multicolored walls, towering into the sky, which are a window into the last billion years. Up ahead, the river changes from a calming green to a turbulent white as you approach the rapids! You’re holding on for dear life as you are bucked around and the river soaks your body as you crash through the standing waves. As you emerge from the violence of the rapids, the serenity returns and your senses resume taking in the majestic landscape, the condors flying overhead, or the big horn sheep grazing near the bank of the river. The Grand Canyon National Park is home to one of the most iconic land formations in the country. Over millions of years, the Colorado River has eroded the many layers of rocks creating what is one of the Seven Natural Wonders of the World. The Grand Canyon is 277 miles long, up to 18 miles wide and over one mile deep! At the base of this magnificent chasm is where our Client Adventure Begins! While on their many visits to the rim of the Grand Canyon, Dan and Mary Comelli often saw the ant-sized people rafting down the river and decided that was something they wanted to experience. In March of 2012, they boarded a 20 passenger plane in Las Vegas that flew them to a few miles from the launch point at Lee’s Ferry in the Lake Powell National Recreation Area. 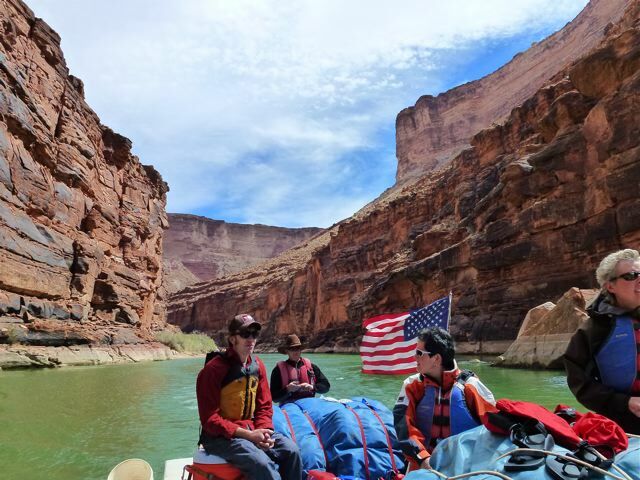 After a short van shuttle ride, they boarded the raft on the Colorado River, which is located a few miles downstream from Glen Canyon Dam and Lake Powell. The motorized vessel and all their equipment, weighing several tons, had been trucked to this site and carefully put together from five large neoprene rubber tubes capable of supporting an amazing 66,000 pounds of gear and passengers! Once they were packed, they set off with fifteen other passengers and two river guides. After a few miles of travel the river enters Grand Canyon National Park. Every few hours, the captain would guide the raft onto secluded beaches where everyone could stretch the legs and attend to nature’s call. Often during these rest stops the group was treated to guide-led explorations of one of the many side canyons only accessible from the base of the Grand Canyon. On returning to the raft, they found they had prepared a tasty lunch! With full bellies, the group loaded the boat and launched down the river for several more miles, encountering breathtaking views and heart pounding rapids along the way. Before too long, the party had reached their first overnight spot. Everyone worked together to set up camp for the night. Once camp was set, the group enjoyed each other’s company over a delicious feast and slept out beneath the stars. Tents and cots were provided for those who wished to use them. Before dawn, the guides made coffee and began preparing the gear for the day’s adventures ahead. After enjoying breakfast, Dan and Mary finished packing up camp and the group all pitched in to load the boat. They repeated this cycle for 6 days, covering roughly 30 miles of river per day. 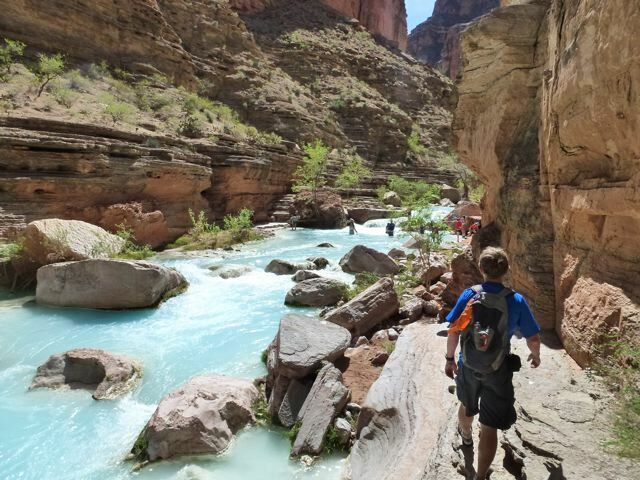 One of their highlight hikes included exploring Havasu Canyon. Within the walls of Havasu Canyon lies a network of dazzling turquoise blue pools and waterfalls. Mary was fascinated while hiking into volcanic rock areas. At one of the turns of the river, the guides pointed out a giant geode (rock with crystal formations inside) about the size of a basketball glittering bright colors in the side of the rock wall. Each day, a bountiful spread was provided at each meal where Dan and Mary ate like royalty and enjoyed the knowledge the guides shared about the geology and history of exploration of this area. Before being helicoptered out of the Grand Canyon on the last day, Dan and Mary had covered over 180 miles down the Colorado River and experienced some of the most awe-inspiring and exhilarating sights on Earth!Although the landscape resembles an alien planet, it is only two states away in Arizona! 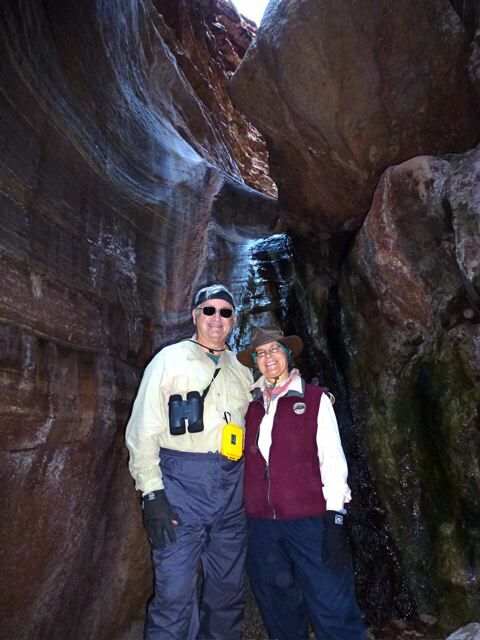 If you are considering your own Grand Canyon River Rafting Expedition, the Comelli’s have a couple of tips. Dan and Mary are currently planning their next adventure to Kenya and Tanzania in December 2013!